Dark sci-fi noir set only two years in the future. Magnus: Between Two Worlds pairs fantastic artwork with a unique storyline. In 2020, Artificial Intelligences (A.I.s) work as butlers, maids, pets and toys. In return, they receive a federally mandated four hours of time off each day. The A.I.s have come together and built a beautiful alternate world called the Cloud where they can live as they wish. But only until their next day of serving humans. Some A.I.s refuse to return to the human world when their four hours are up. The human police send Dr. Kerri Magnus into the Cloud to find and return those rogue A.I.s. Dr. Magnus starts to feel empathy for the A.I.s. She changes professions and becomes an A.I. therapist. She tries to coax AIs to accept their lot in life before they go rogue. However, a mysterious group comes together to fight A.I. oppression. Their methods include murder and mayhem. Can Dr. Magnus stop them before they kill again? The world building in Magnus: Between Two Worlds is awesome! Two complete worlds of the future are distinct enough to easily tell apart. Dr. Magnus’ back story is slowly revealed as the main detective story is told. The artwork is innovative with many panes shown vertically rather the standard horizontal layout. Artful blurring and smudging effectively portray the electrical waves supporting the A.I.s’ world. Magnus: Between Two Worlds is highly recommended for both science fiction and noir fans. 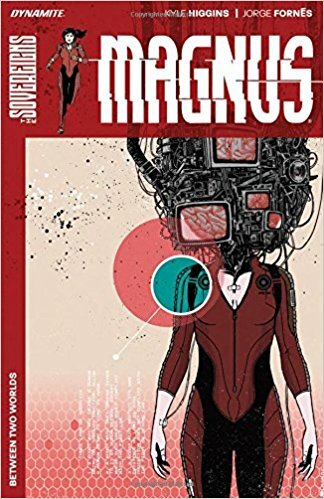 It collects issues 1-5 of Magnus. Despite receiving excellent reviews, the series was cancelled so this book contains the entire story of this reboot of the Magnus Robot Hunter comics from the 1960’s and 1990’s. 5 stars! Thanks to the publisher, Dynamite Entertainment, and NetGalley for an advanced copy.